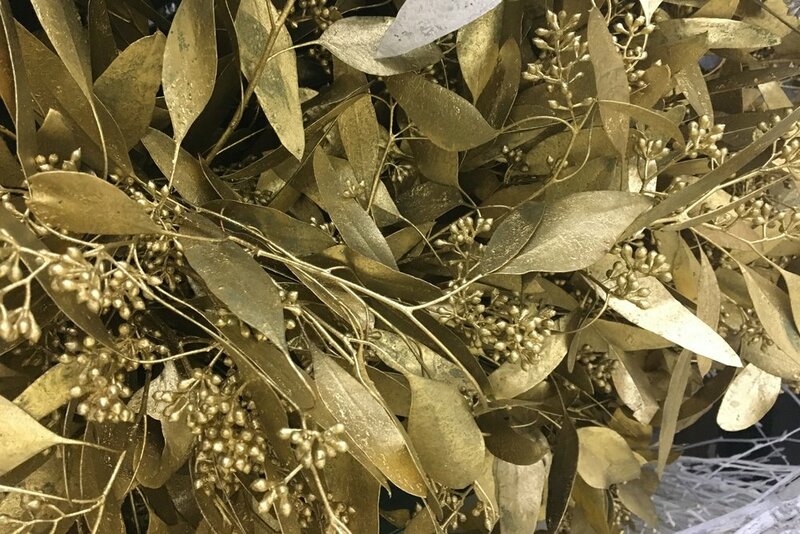 Every year in late November, we head to Welch Wholesale Florist on the near west side of Indianapolis to pick up several cases of greens and garlands for winter decorations. Their building is a happy space full of bins and boxes of gorgeous flowers. The most fantastic plant smells fill the air. It’s always a little chilly to protect the plants, even outside of the refrigerated room, but it’s hard to complain when you’re surrounded by so much beauty. Vivid flower photos cover the brightly painted walls of the office space. Yesterday when we picked up a shipment we spent some time talking with Annie and Nora, the current owners and the daughters of the owner and founder, about decorating with fresh greenery and about the challenges, rewards, and surprises of working in their industry. There are five basic kinds of evergreens Welch typically sells for winter arrangements: cedar, pine, spruce/fir, hemlock, and juniper. When we make our arrangements, these materials form the backbone of the design and fill in space. Each of these come with their own variations with different shades of green, different textures, and in some cases berries and cones. 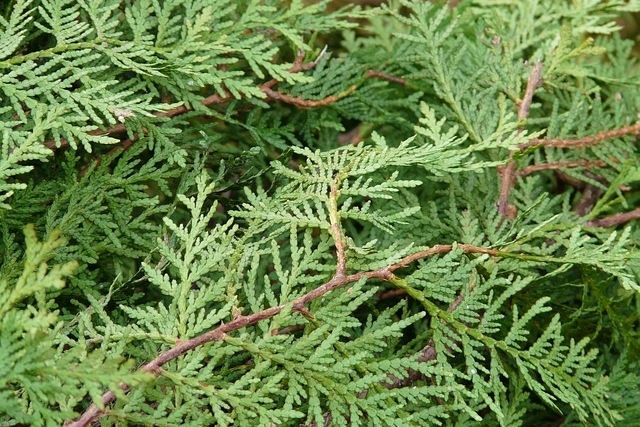 For long-lasting color, cedar is their favorite evergreen. It takes much longer than the others to lose color, and they don’t drop needles the way some do. 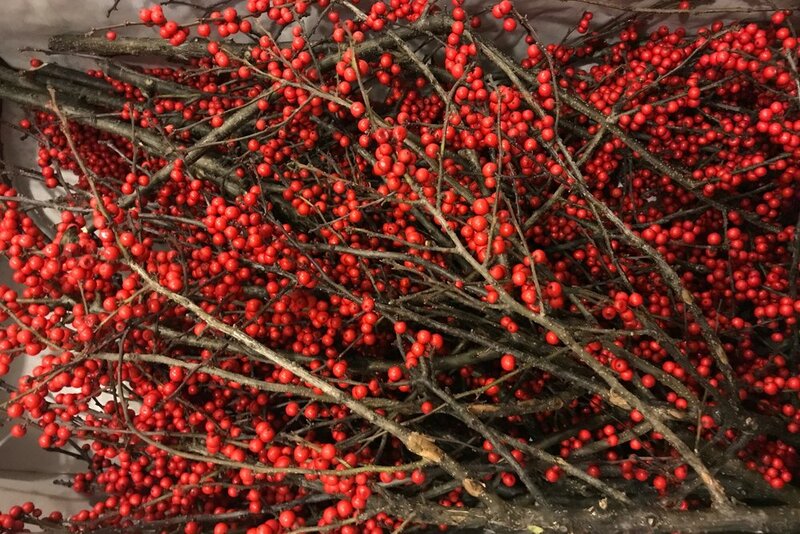 But beyond the evergreens, they have some favorite accent plants for strong color: winterberry, flocked branches, painted eucalyptus, and white birch poles. 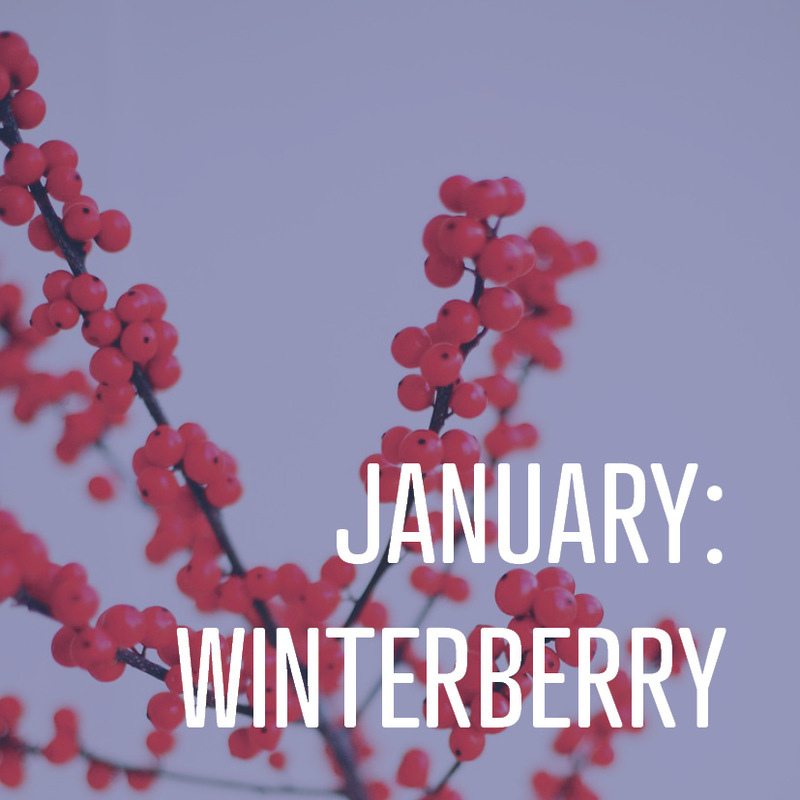 It’s those accent materials like winterberry that really bring an arrangement to life, and most of their favorites are those accent pieces. Some that they especially love are magnolia, silver bell eucalyptus, painted eucalyptus, winterberry, and flocked branches. In addition to knowing more about the varieties of greenery and other cut materials, we also wanted to know more about what it’s like to work in the cut plant materials industry. 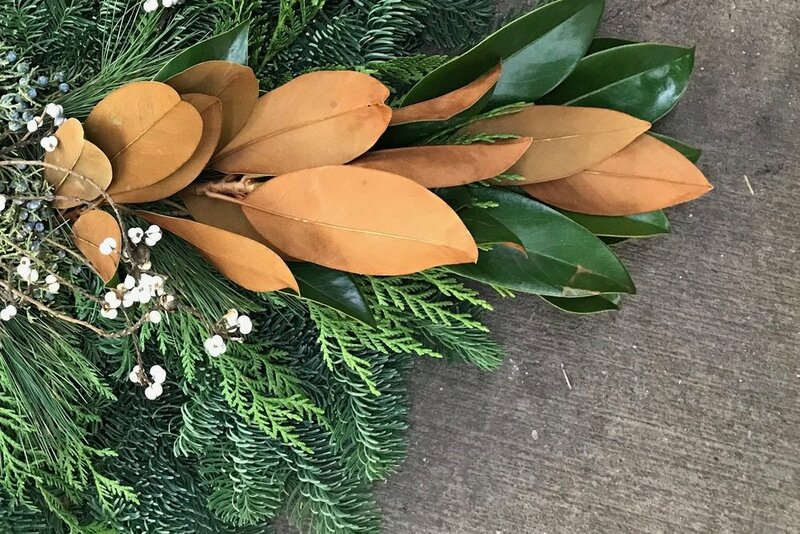 In addition to seasonal materials like what we buy from them, they sell just about any cut flower you can imagine, and they shared some insights specific to holiday decorations and some that apply to their full range of cut flowers and materials. Bleached fern fronds add unique texture to this door swag made by the staff at Welch. When it comes to holiday materials, one of the greatest challenges is the seasonality of the work. Hundreds of feet of garlands and pounds of branches are sold through Welch alone over the course of about two months. This means a sudden spurt of work not just for Welch, but for their suppliers as well. Many of the greenery suppliers are small family businesses that are able to operate with a small staff most of the year, but once harvest time hits they need as many employees as they can get. These suppliers are facing the same labor force challenges we discussed a few weeks ago, especially when it comes to the dramatic reduction in work visas and increases in deportations this year, but for them it’s even harder to find employees to do such hard labor for just a few months. Weather is a struggle for all people working with plants outdoors, but when your company’s success for the year depends on the weather in just a narrow range of time, the struggle is compounded. One year, a particular type of popular cedar just was not available because the weather conditions that year did not enable the plants to develop their signature yellow immature cones. This year, growers in North Carolina (one of the biggest states for greenery production) are in bad shape because Hurricane Florence destroyed or damaged so many of the areas they harvest from. 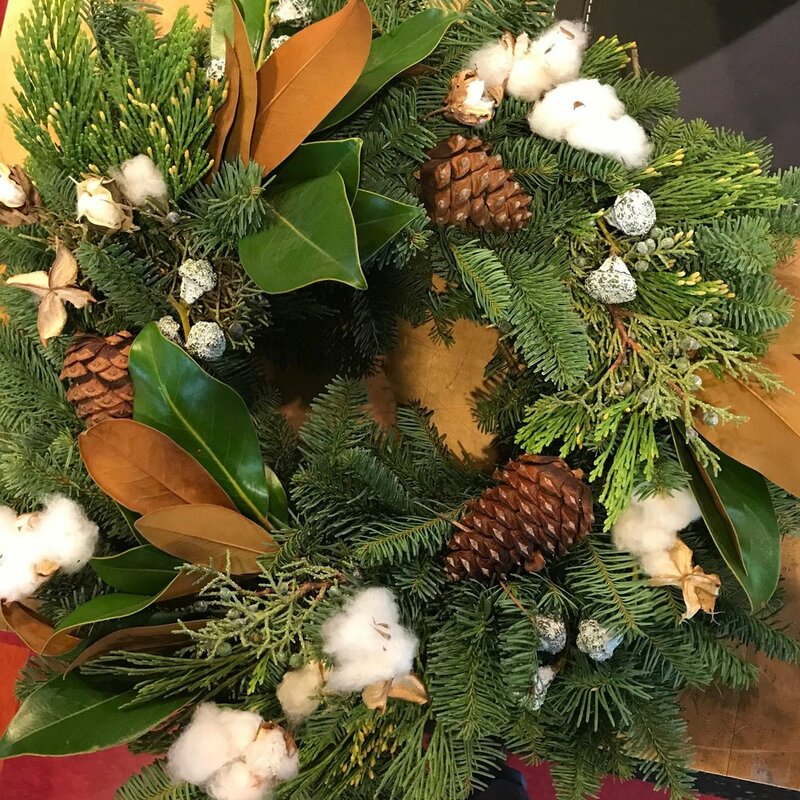 The snowy cotton really pops on this wreath, also made in-house at Welch. This leads to one of the biggest challenges facing both Christmas green producers and cut flower growers: climate change. Climate change is shifting where different plants grow and how reliably they can be harvested. For smaller holiday greens companies, this is difficult because they often have long family histories in an area and can’t move around easily, plus they rely on their current relationships with the places where they harvest (Did you know that greens are often harvested responsibly from nature preserves and other wild areas? We didn’t!). On the flip side, the cut flower industry is an incredibly high-tech industry dominated by large companies with acres and acres of greenhouses and fields, mostly in Ecuador and Colombia. They can’t simply pick up and move such large operations. On the bright side, climate change does expand the range of flowers Welch can source and the months certain flowers are available. Peonies used to only be an option for spring and summer brides, but now they can be grown late into the fall! We talked a lot about the challenges facing their company and their industry, but Nora and Annie wanted to be sure to end on a positive note. Despite the challenges of working with fresh cut plants, they think fresh arrangements bring something into our lives that just can’t be replaced. Even with synthetic options becoming more and more life-like, you can always see the difference. But more importantly, the fragrances of fresh holiday greens and wedding bouquets and sympathy arrangements sears help build and cement memories the way nothing else can. Fresh decorations bring their own special magic to the holiday season, and they love being a part of bringing that magic to people. Want some daily flowers to brighten your Instagram feed? Follow them at welchwholesale! It’s one of our favorite accounts to follow.